Whenever I go out, I take my backpack. It's my exoskeleton. 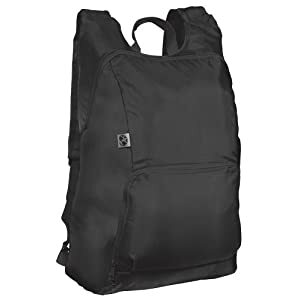 If you're the same way, you might be interested in considering an ultralightweight backpack. I like my old Kensington laptop backpack. But my luggage scale tells me that it's 2.3 lbs. Surely we can do better. There are a couple of ultralightweights that I'm going to check out next weekend. The Packable Daypack is 0.5 lbs and holds 11 L. But it's a bit flimsy and the outer pockets don't have zippers. $25. The other one I'm going to check out is the Eagle Creek Compass. 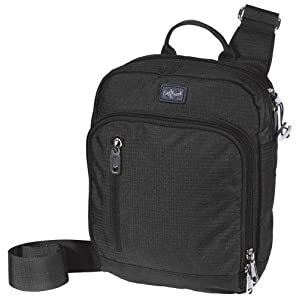 It's 0.6 lbs and is sturdier, and has zippered compartments. But it only holds 2 L. That might be good enough though. $35. posted by Jonathan at 7/11/2010 10:12:00 a.m. I like the second bag you listed. The bag looks brand new after a couple of years. But my son took a liking to it and now it's his. Now, I am looking for a new bag. I was thinking of getting the large size version of the Cafe bag but I am going to check out the Eagle Creek Compass. By Anonymous, at 7/12/2010 3:15 p.m.
@Carlos - The Cafe bag looks good. By Jonathan, at 7/21/2011 8:26 p.m.